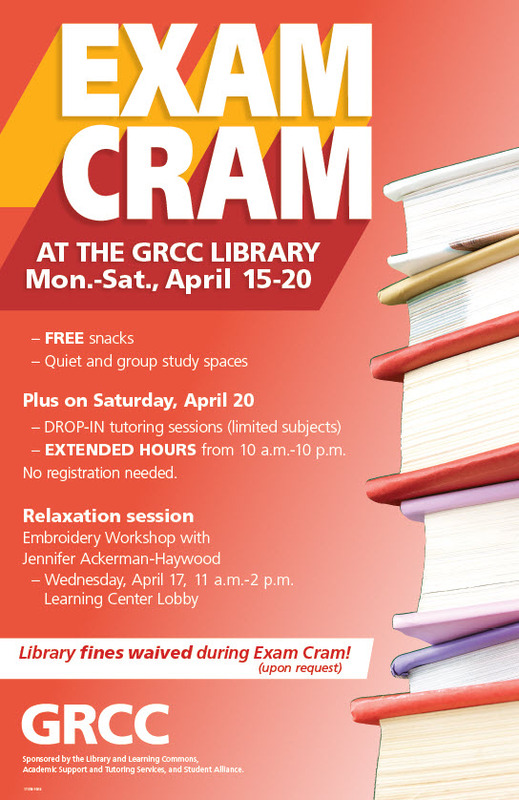 This Saturday – April 20 – your GRCC Library will be open extended hours for Exam Cram. We’ll be open from 10 AM – 10 PM, with snacks, drop-in tutoring, and space for quiet study, Join us Saturday! An Exam Cram special event – discover how the repetitive nature of stitching helps you relax! Join us for a FREE Embroidery Workshop with adjunct journalism professor Jennifer Ackerman-Haywood, host of the CraftSanity Podcast. All supplies are provided for free. No experience necessary. As you finish off assignments and prepare for exams, plan to join us during the Library’s Exam Cram. Starting Monday April 15 through Saturday April 20, the Library & Learning Commons is your place to polish off that paper and find the quiet you need to study for those finals. Plus – snacks! Exam Cram for the Winter 2019 semester will be held from Monday through Saturday, April 15 -20, with extra long hours (10 AM – 10 PM) Saturday! This semester, in addition to the free snacks, quiet and group study spaces, and Saturday’s Drop-in Tutoring, we’re offering a FREE Embroidery Workshop with Jennifer Ackerman-Haywood, host of the CraftSanity Podcast and GRCC adjunct journalism professor. Embroidery samplers and all supplies will be provided. Last semester’s weaving workshop was a blast and this will be too. No experience necessary. See you there! Last night’s Poetry Reading and Book Signing event with Katie Kalisz was a success! Katie shared a variety of poems to an engaged audience of students, faculty, staff, retirees, and community members. Thanks to Maryann Lesert for her introduction of Katie’s career and works, and to Mike Klawitter for creating a display of Katie’s work. We’ll post the streaming video as soon as it is closed-captioned. This event was sponsored by the Library & Learning Commons and the English Department.